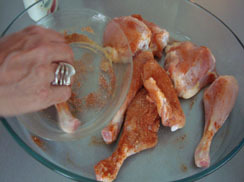 Season chicken with ginger powder,paprika and salt a couple of hoursbefore cooking. 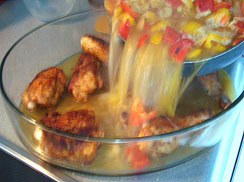 In a frying pan sautée chicken on all sides and in another or in a wok, sautée peppers and onions. 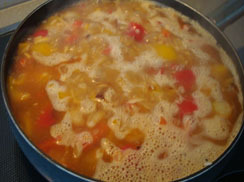 Add almonds, then pour in stock and simmer for 10 mins. 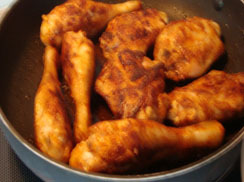 Organize chicken in baking tin andpour in mixture. 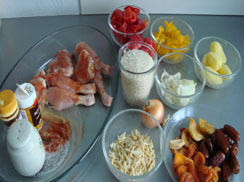 Squeeze in rice, potato wedges and dried fruit. Cover with foil paper .Bake to 180° for 30/40 mins. 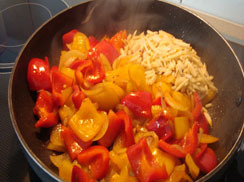 until rice and potaotes are tender.